But later on, seeing his close friend Ramakrishna Acharya accepting initiation from Narottama das and noticing the sudden change in his friend’s spiritual consciousness, planted the seeds of faith in Ganga Narayana’s heart. He could understand that Narottama was a great soul. Ganga Narayana quickly woke up, and after finishing his morning duties, started off for the Ganges (This tributary of the Ganga/Padma that flows over Murshidabad, is now known as ‘Bhagirathi’). Seeing Thakura Mahasaya ,Ganga Narayana immediately fell unto his lotus feet. He begged Narottama Thakura to accept him as his disciple and grant him initiation. Narottama das Thakura initially declined Ganga Narayana, saying that Ganga Narayana was a brahmana whereas Narottama was a Kayastha (lower caste) and it would create a controversy if he were to initiate a brahmana. The other Brahmanas would criticize Narottama as well as Ganga Narayana and create a problem. Ganga Narayana then replied that one who obtained the mercy of Narottama becomes fearless and does not care anymore for the social conventions or criticisms of those who are devoid of any devotion. Observing Ganga Narayana’s determination and dedication, Narottama das Thakura became very pleased. He soon initiated him on an auspicious day. Ganga Narayana began studying the scriptures of the Goswamis and incessantly engaged himself in Harinama sankirtana. He became more effulgent and filled with ecstatic love. Many brahmanas criticized Ganga-Narayana for having accepted initiation from a lower caste Narottama. But these had no effects on Ganga Narayana who had finally discovered the objective of his very existence. These brahmanas who had then criticized Ganga Narayana later accepted initiation from him.Just as Narottama had initiated and rescued innumerable fallen souls, similarly it has been mentioned that Ganga Narayana had countless disciples. He was very dear to residents of Vrindavana. His wife ,Narayani devi, and daughter, Vishnupriya devi, were exalted devotees and assisted him in his services. 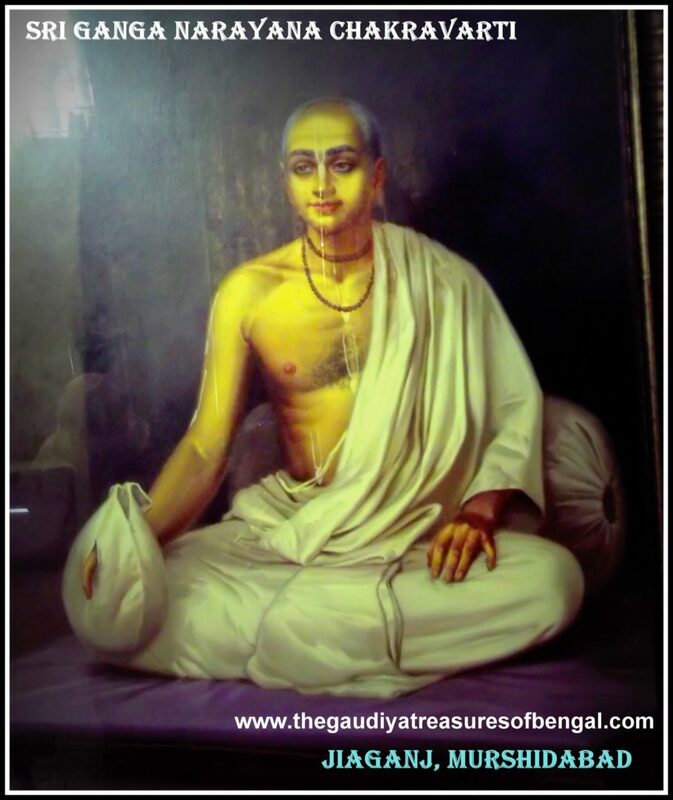 Sripat Gambhila, the residence of Ganga Narayana Chakravarti, is the sacred site where Narottama das Thakura used to often come and stay with his dear disciple.At this exalted dham lies scattered the dust of Thakura Mahasaya’s lotus feet. 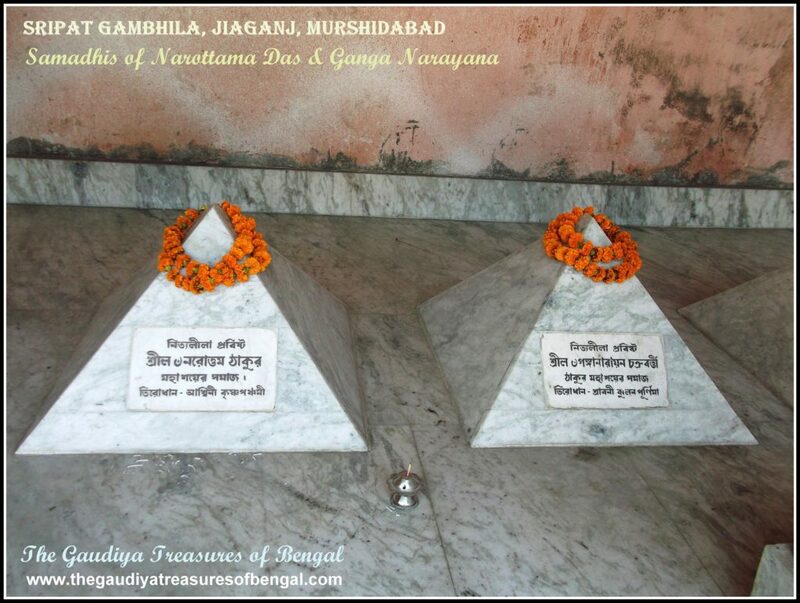 It was also over here at Gambhila that Narottama das Thakura subsequently disappeared from this world in the year 1611 AD, merging with the waters of Bhagirathi (the tributary of Padma that flows through Murshidabad). The Bank of Bhagirathi where Narottama das Thakura entered the river and vanished just as milk dissolves in water, is now known as ‘Dudhghat’ (Dudh translates to milk in bengali) and is an exalted place of pilgrimage for the Gaudiya vaishnavas. The localites sometimes also refer to this river bank as ‘Neemtala ghat’, owing to a beautiful Neem tree that adorns this place.We noticed that ‘Bhaktivedanta Swami Charity Trust’ has constructed a beautiful gate on this river bank, to commemorate this auspicious pastime.The residence of Ganga Narayana Chakravarti ,however, is situated a few Kilometers from Dudhghat and has since come to be renowned as ‘Bodo Govinda Bari’. 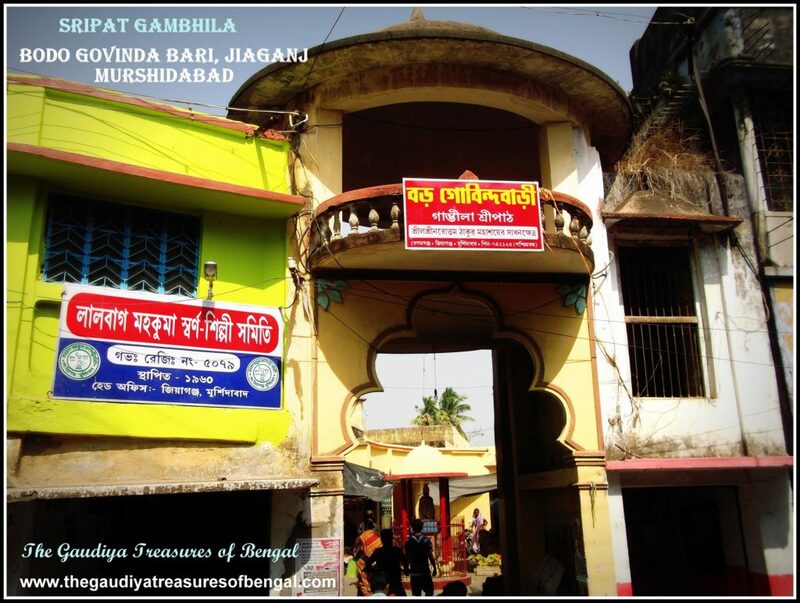 Bodo Govinda bari is only a few minutes ride from the Jiaganj Railway station. At Bodo Govinda Bari rests today the enchanting Golden Gauranga deity, that was once worshipped by Narottama das Thakura. There is a very interesting pastime regarding how Narottama das Thakura discovered this Gauranga deity. In the province of Gopalpur, there lived a pious brahmana whose name was Bipradasa. Mahaprabhu revealed to Narottama das Thakura in his dream one night that his beloved Gaura Vishnupriya deities were presently resting at the house of this brahmana. These deities laid hidden in his huge container of paddy. Actually, when Mahaprabhu left Bengal for Puri, after accepting His sannyasa initiation, He manifested these enchanting deities and hid it inside the Ganges. In the course of time, they landed up in the house of this brahmana, but this brahmana was completely unaware of this fact. Wherever Narottama das Thakura went, he carried his beloved Gauranga deity along with him. Narottama das was mad in ecstatic love with his beloved Gauranga. So when Narottama das Thakura arrived at Gambhila, at the residence of Ganga Narayana, for the final time before he merged with the Ganges, he had carried this golden Gauranga (‘sonar Gauranga’) deity along with him from Kheturi. This beautiful deity has remained at ‘Bodo Govinda Bari’ ever since and attracts innumerable pilgrims from all over the world. Narottama das Thakura was absorbed in singing the glories of Lord Gauranga and Nityananda day and night. By the mercy of his lotus feet ,several atheists, agnostics, offenders, demigod worshippers, dry logicians, speculators, etc were delivered. Hearing the terrible news of the disappearance of Sri Ramachandra Kaviraja,who was his very dear friend, Narottama plunged into an ocean of grief. The spiritual master of Ramachandra, Sri Srinivasa acharya, who was also a very dear friend of Narottama Thakura ,soon passed away as well. 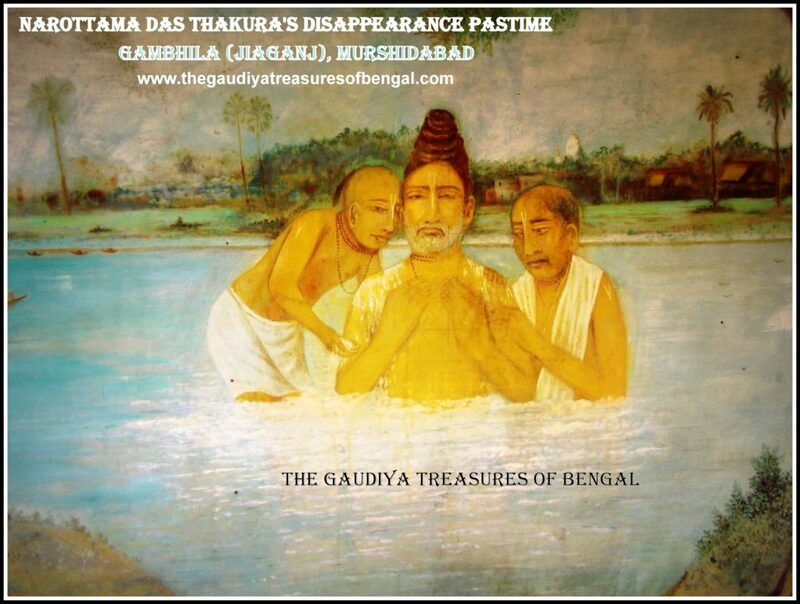 Arriving at Gambhila, Narottama das Thakura ordered his disciples Sri Ramakrishna and Ganga Narayana Chakravarti to arrange for his bathing in Padma. He entered the waters after repeatedly paying his obeisances. Standing there in the water ,he then ordered his disciples to wipe his body. Then, as Ganga Narayana and Ramakrishna, were cleansing the body of their spiritual master, Sri Narottama merged into the waters of Padma and vanished from worldly view. His disappearance was just as milk vanishes in water. It is believed that Thakura Mahasaya wrapped up his earthly Leela and manifested his disappearance pastimes in the year 1611 AD. This bank of Bhagirathi (the tributary of Padma that flows over Murshidabad) where this pastime took place has come to be renowned as ‘Dudhghat’.Sri Narottama das Thakura’s tirobhava is celebrated on the Kartiki Krishna panchami tithi. We worship the lotus feet of our spiritual master ,whose causeless mercy has empowered us ineligible fools ,to gain entrance and take up service in this exalted abode of Gambhila. We seek shelter of this holy land, and pray that its glories remain forever imprinted in our heart.‘The Gaudiya Treasures of Bengal’ offers millions of obeisances and humbly prays to Sri Ganga Narayana that we advance in our Krishna consciousness, develop attachment unto the lotus feet of Lord Gauranga and are able to serve Sri Guru & Vaishnavas, by our honest and sincere efforts. We seek his blessings and compassion , in successfully rendering this humble service of reciting the pastimes and revealing the pastime places of the Supreme Lord and His beloved associates.We shall consider ourselves greatly fortunate and our existence meaningful if Lord Gaurahari and our dear spiritual master are kindly pleased with our endeavours. 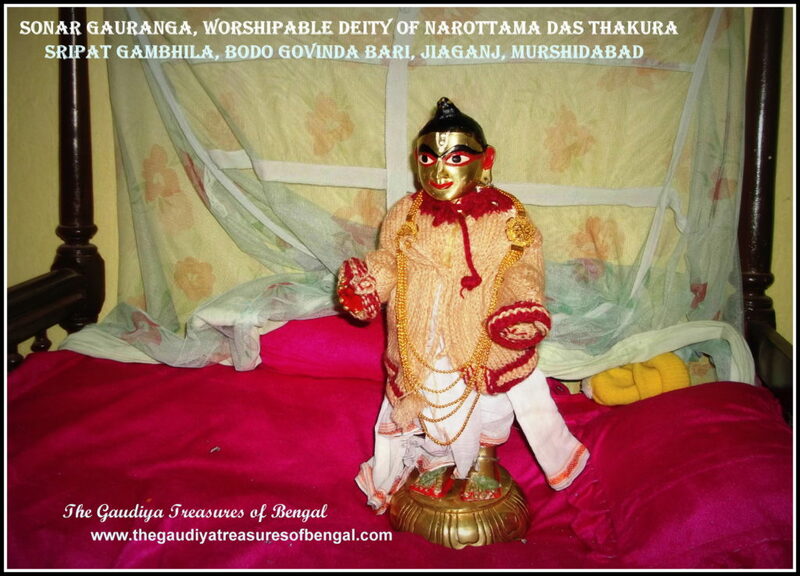 The enchanting deity of Lord Gauranga, which was once worshipped by Narottama das Thakura. This mesmerizing deity has stolen away our hearts and been our object of vision ever since we obtained His blissful darsana. The deities of Sri Radha Ramana jiu, which is also believed to have been originally brought from Kheturi and was previously worshipped by Thakura Mahasaya. 44 salagram Silas are served and worshipped over here. It is also widely believed that the salagram sila which Mahaprabhu had gifted to Raghunatha das Goswami is also present among these 44. 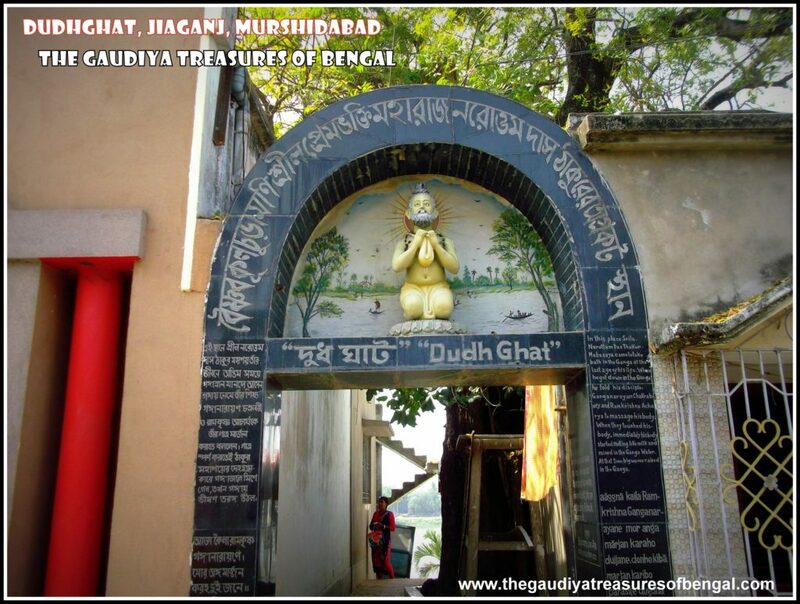 A few Kilometers from the Bodo Govinda Bari is situated Dudhghat (also known as Neemtala ghat), where Narottama das Thakura merged with the waters of Bhagirathi. The temple is currently administered and maintained by the descendants of Ganga Narayana Chakravarti. The devotees at this place were very gracious and cordial. 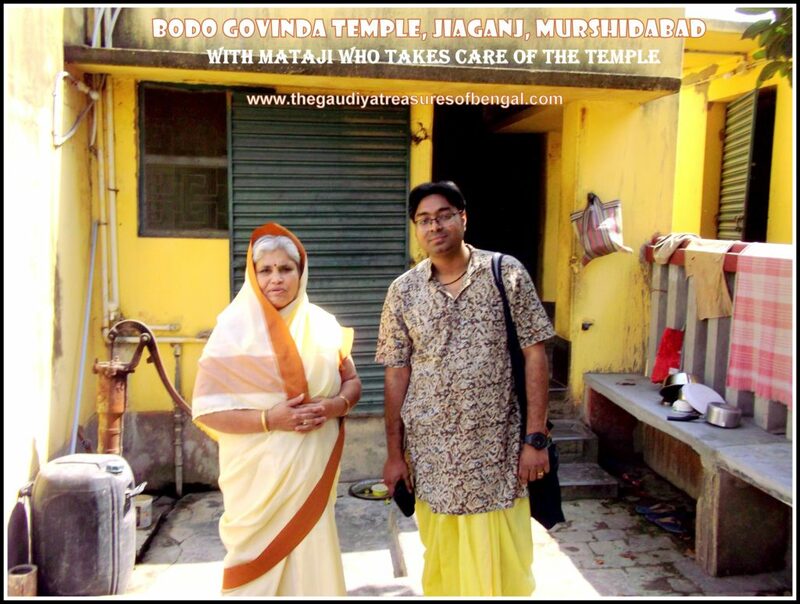 One of the elderly matajis, who looks after the temple, mercifully showed us around the place. She even took us inside the house and allowed us to take photographs of the deities, even though the altar was closed and the deities were resting at the time. Murshidabad is well connected to Kolkata via roads and railways and it takes hardly a few hours for one to reach Murshidabad from Kolkata. Jiaganj is situated a few stops from the Murshidabad city. 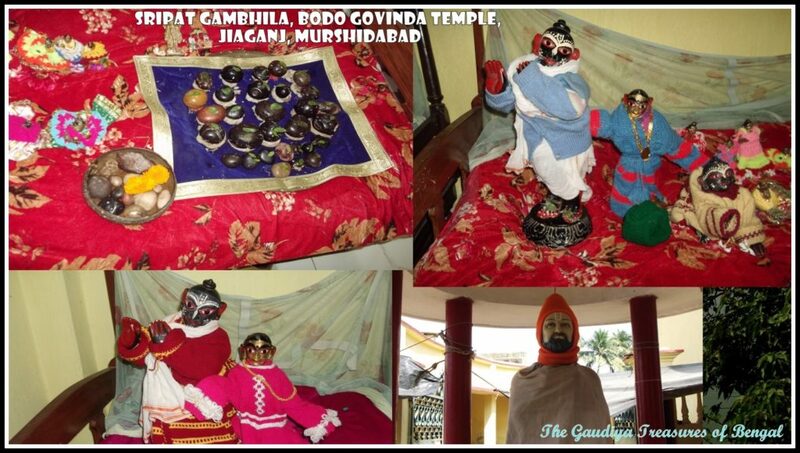 ‘Bodo Govinda Bari’ is hardly a few minutes drive from the Jiaganj station. The temple is situated near the locality of Begamganj. The temple is quite renowned in the locality and is situated amidst a busy marketplace.Dudhghat (locally renowned as the Neemtala ghat) is hardly a ten minutes auto ride from the ‘Bodo Govinda Bari’ temple. Accommodation – One can choose to stay at any of the prominent hotels of Murshidabad city. Jiaganj is hardly a half-hour drive from Murshidabad city.